Learn about our available options. Let us answer it for you. Like us on Facebook to see the great deals. For Good Sam Members. Show Membership at Check-In. Valid on nightly RV site rates only and may not be combined with any other offers. Hooves N Wheels RV Park is designed with convenience in mind. Whether you’re in Mineral Wells, Weatherford, Ft. Worth, Cresson or any of the surrounding communities, you’ll love our proximity to highways such as I-20, US-171, US-180 and Granbury Highway. We are proud to provide a quiet atmosphere, full hookups, hot showers, rec room, laundry facility and much more. When you visit Hooves N Wheels, you’ll get so much more than a parking spot – you’ll enjoy a pleasant experience from the day you pull up to the day you take off on your next adventure. With 24-hour access every day of the week, you can take your boat or RV out for an excursion and return to Hooves N Wheels at a time that suits you best. Our sites are clean, beautiful and spacious. We are only 30 minutes from Ft. Worth and a few miles away from downtown Weatherford, you’ll be at the heart of the city’s greatest attractions in no time! Did we mention that we provide a place to stay for your horses too? 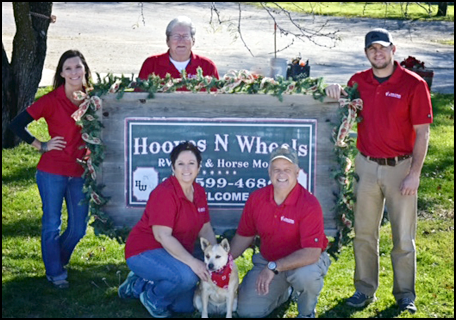 Whether you’re traveling across the state with your horses or you just want to bring your horse along for the fun, Hooves N Wheels is the perfect place for you. The barn has large, covered stalls with access to a round pen and arena. Call us for details. Give us a call to set up your reservations. Need group reservations? Contact us at 817-599-4686 for your next get together. We love our military servicemen and women and welcome them to Hooves N Wheels. Discount applied to Weekly and Monthly stays only. Must show valid proof of military service at the time of check in. Military discount on regular rates and may not be combined with other offers. Effective August 1, 2016, HNW will no longer accept cash for nightly, weekly or monthly fees. We will continue to accept Visa, Mastercard, Discover, personal checks & money orders. "Great Park! Excellent Management! Friendly Owner!" Another "Great Park!" Even though we have been here only a short time, the staff has treated us like family. After visiting numerous other parks we have come to the conclusion that our decision to stay here was the right one. This by far is the best run, the cleanest, and the quietest park that we have visited. We hope to make our stay for a long time to come.